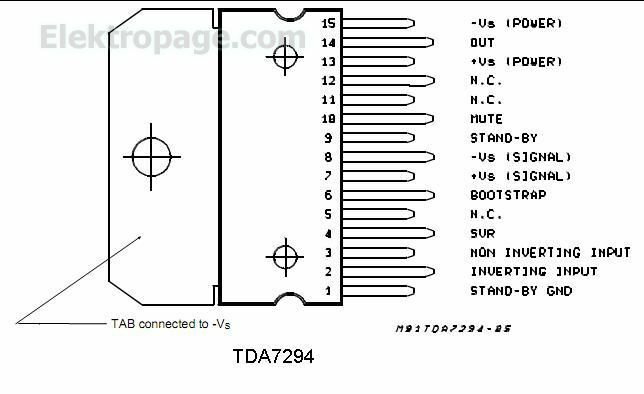 he TDA7294 is a monolithic integrated circuit in Multiwatt15 package, intended for use as audio class AB amplifier in Hi-Fi field applications (Home Stereo, self powered loudspeakers, Topclass TV). 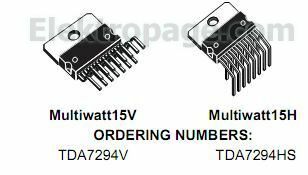 Thanks to the wide voltage range and to the high out current capability it is able to supply the highest power into both 4Ω and 8Ω loads even in presence of poor supply regulation, with high Supply Voltage Rejection. The built in muting function with turn on delay simplifies the remote operation avoiding switching on-off noises.